WAIST HIGH: Ultravox To Begin Second Leg Of Their Comeback Tour. Ultravox To Begin Second Leg Of Their Comeback Tour. Following their 2009 reunion, Ultravox will hit the road again this month "to present the Return To Eden Part II tour. Rumored to be the last Ultravox tour - this follows amazing fan reaction, a string of sell out venues last year (including two London shows) phenomenal public demand, very high critical acclaim and stellar reviews from the media. The band will perform six shows across the UK with more to follow in the form of a six date German tour and additional dates throughout the rest of Europe - tickets for the events are selling fast." 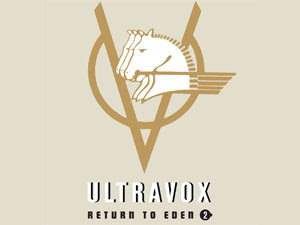 Ultravox's 2009 live album Ultravox Live at the Roundhouse will get a UK release on Apr. 5 on EMI "in two formats: a DVD + 2CD Special Edition containing the full 18 track live performance in both audio and video, plus a 39 minute 'Building Eden' reformation documentary, and a 13 track highlights CD (audio only)." Ultravox is currently their classic line-up of Warren Cann, Chris Cross, Billy Currie, and Midge Ure.